Half Full – Half Empty? 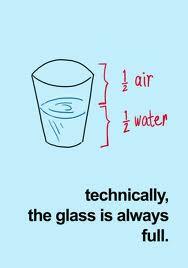 Do you see the glass as half full or half empty? Me? I ordered a burger! Is it all part of our perception or our mood of the moment? Are you tired of people telling you to look on the bright side? And there always is a bright side, you know! 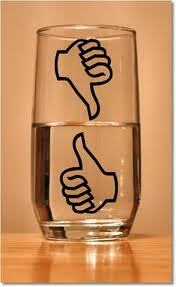 For example – even if the glass is half full – there are no calories in water. And, if it’s half empty – you’re on your way to your 8 glasses a day. Diet sites and support programs are always telling us to look on the bright side, the attitude is what gets things done. “Nothing worth having comes free.” or “If you don’t like something, change it. If you can’t change it, change your attitude.” – Maya Angelou. Or “Weakness of attitude becomes weakness of character.” – Albert Einstein. And “Attitude is a little thing that makes a big difference.” Winston Churchill. A couple of weeks ago I thought my whole life derailed. I cannot go to work now, I’m in pain, I’m feeling really sorry for myself and someone told me yesterday that I was making a good job of looking like I’m positive and managing. I’m also way off the weight management plan. I’m gaining weight and I know why! I’m eating more and exercising less. Physics and biology together. Actually – it’s the half full – half empty thing, too. I’m feeling half full so I want to fill up. No one wants to feel half empty. Hollow is not a good feeling but I found a great picture for that, too. Nature abhors a vacuum. (I love the word “abhors”.) So what do you fill the space with? That’s where the “attitude” come in. Attitude has taken on different connotations in past 10 or so years. “She’s got an attitude.” or ” Lose that attitude young man!” are common things we hear about teens. But we admire that fact that people, including teens, are standing up for themselves in some way. So, what AM I going to do? I’m going to take that trifecta bet and show my attitude. It may look like whining kitty or vicious wolverine. It’s attitude. I’m going to drink all my water today and not worry about how much is in the glass, I’ll just add ice. And some day I will be quoted. Actually I do get quoted. Students and former students of mine say they are “miffed” or “Mightily miffed!” when they are a little or greatly pissed off. saying “Pissed off” is attitude but not appropriate for a classroom – miffed is. So maybe I’ll be quoted like Ted Nugent or Miley Cyrus. ~ by 1fatgirlshrinking - Diane Kirby on April 5, 2012.